weeks leading up to the holiday on the 21st. 19th. Scrounge up your craziest costumes and cheer on the launching snowboarders! display your gemstones and bring smiles to the important people in your life. The month of March has promise to turn into a lamb this year. Much is happening during this month of change and Karats is here to help you celebrate! March Madness is in full tilt; what better way to cheer on the team than with a green aventurine to lend some good luck to your bets. On the 8th of March, we celebrate our ladies with International Women’s Day. Remember the strength and grace of a woman in your life with a tourmaline to symbolize her growth and story. Aquamarine, this month’s birthstone, is perfectly selected to mimic the thawing season as the cool blue opens communication, soothing the soul while keeping one’s mind in crisp clarity; ideal for all movers and shakers. A bit of protection is advised for March 15, as the Ides of March is fraught with treachery and uncertainty. On the anniversary of Caesar’s demise, made all the more popular by Shakespeare’s infamous line, “et tu Brute’”, an ancient Roman coin from Dan’s collection will make for a pointed reminder. Black Tourmaline will ground your judgment through the day and repel negative energies, while jet will bring you to a place of reflection and protect you through the attraction of sympathy. Different sort of protection can make St. Patrick’s Day, on the 17th, a blast this year. The ancient Greeks swore by Amethyst as the ultimate anti-hangover gemstone; it was believed the darker the stone the more wine it would soak up and the less alcoholic effects were felt, allowing for more drinks! Spring Equinox occurs on March 20th this year. It’s the perfect chance to pick up that New Year’s Resolutions list you’ve already given up on. Peridot, historically, was seen as a gift from the gods, a symbol for an abundant life filled with rewards. This is an excellent crystal for blocking and overcoming negative patterns that keep making an appearance in your life. Don’t forget! March 10th is Daylight Savings when we spring forward! Sunstone can help accept the lack of sleep, replacing the morning grumps with a sunny outlook! The team at Karats is here to pair you with the gemstone you need in your life. Dan is available to make appointments to create the perfect custom design to display your gemstones and bring smiles to the important people in your life. Love is in the air and snuggled in front of warm hearths this month. It may be chilly outside but keep your loved ones’ hearts from icing over by remembering and appreciating them this month. We honor our fellow man in the observance of Black History this month; may we never cease striving for understanding and equality. We apreciate our friends and partners by celebrating Valentine’s day mid-month; it just takes a moment for a kind word and a thoughtful gesture to rekindle a relation gone cold this winter. Here at Karats, we would like to honor you this month. Come in to be warmed by friendly staff, cozy atmosphere, and the wide variety of lovingly designed art. Koji Kawamoto, the pearl ambassador, will be back with his collection of lustrous pearls from the 14th through the 18th. Dan has his heart-shaped gems on display, awaiting the custom setting you desire to show your love. There are different stones for the different types of love in your life. Fire Opal: Passion-awakener, rids shyness and defeatism and promotes sexual enjoyment. Emerald: Healing-compassion, opening the heart, alleviating emotional heaviness allowing hope and courage to flow and make space for love to settle. Watermelon Tourmaline: Joy-teacher, focusing on the balance of passionate pink and nurturing green, allowing self-love and respect to influence others. Turquois: The Truth-teller, promotes open communication, perception expansion and aids in peace-making. Rhodochrosite: Love-stoker, gives a new spark to a cooled flame. Kunzite: Relation-strengthener and soulmate-searcher, focusing on deepening bonds and understanding between people. Rose Quartz: Ever-flowing general love, focusing on the ability to give more love to your fellow human when everything is going well in life. Happy December and Merry Christmas to all in Vail! It is a wonderland to behold as the snow seems to be here to stay and the skies are yet so blue! The slopes are open and the powder is real! Here at Karats we are busy getting ready for the December market happening the 15th and 16th. Stop by our booth in the Solaris Plaza to see the art our apprentices have created for you. We also have some inside shows coming up! Koji Kawamoto will have his vast expanse of pearls on display from December 21st through the 24th. After Christmas we will be hosting Carolyn Tyler from December 26th through December 31. Her spectacular jewelry made of 22k gold from Bali is worth seeing. We will be extending our hours assuredly to 9PM starting December 15th. Happy November here in Vail. The holidays will be here before we know it! Snow blanketed the Vail Valley this first week of November. Many excited winter sports enthusiasts appeared fully dressed in ski gear on the mountain. Never mind the lack of ski lifts running. Here at Karats we are busy getting ready for the December market. We also have some shows in December which we are proudly announcing the dates of early. Koji Kawamoto will be here December 21-24th with his amazing selection of pearls from around the world. Then after Christmas we will be hosting Carolyn Tyler, Dec. 26- Dec. 31, 2018. Her spectacular jewelry made of 22k gold is worth seeing. A Spook-tacular October to Vail! What an exciting month of events to harken in the harvest season! Oktoberfest continues through this month, showing off the best in beers and local brews as well as food, activities, and shopping for the whole family. At Karats, we eagerly await the annual Children’s Trick-or-Treat Trot to see all the creative costumes this year! We are open every day 10- 6. Dan is available to design upcoming birthday, anniversary, and holiday gifts for you! Call ahead to schedule an appointment with him to create something unique and one of a kind for that special someone. We are looking forward to the first snowfall and very snowy holidays. The rain we have had is a good start, but we say, “Bring on the fluffy flakes!” Thank you to everyone who takes the time out of their days to stop in to the store, call in, and support us! Have a happy and safe Halloween, Folks! Summer in Colorado is slowly wrapping up for the year. The mornings are crisper and the evenings are earlier. The days grow quieter as the kids settle into their studies and the tourists into their departing seats. Enjoy these lovely days of gold when the sun shines warmly and the leaves are showing off! Here at Karats, gold is on display every day! Until Thanksgiving, we will be open from 10AM-6PM, Monday through Sunday. The Vail Farmer’s Market, hosted in Vail Village every Sunday morning until 3PM, continues to be an exciting weekend event until October 7. Thank you to everyone who came out to see Elisa Browsh of Elyria Jewels during her stay from August 31st – September 3rd. Our next big event …is the semi annual show Dan travels to in Oklahoma City, OK.
Birthdays, anniversaries, special events, and holidays are fast approaching! Dan is available to design and will be available most days. Call ahead to schedule an appointment with him to create something unique and one of a kind for that special someone. Hello, from beautiful Vail, Colorado. The summertime is in full swing. We have been spending our days hiking, biking, and enjoying the incredible outdoors. It is prime wildflower season at the moment and the weather is just perfect. Our Pearl expert, Koji Kawamoto, will be here the last week of July through the first week in August. He will have his full extensive summer as well as fall Pearl Collections with him to admire and acquire! Dan is available to design and will be in most days. Call ahead to schedule an appointment with him to create something unique and one of a kind. From beautiful Vail, Colorado. The end of the ski season is upon us. Vail will close this Sunday on April 15, 2018. Much fun was had and now we are on to hiking, biking, and some quiet days too. Here at Karats we will be open 10-6 Monday thru Friday. 11-6 Sat and Sunday. We will begin spring hours on April 16, 2018 and continue until the first Farmers Market on Fathers Day June 17th , 2018.
possible impression on Mom. Along that line, we have some amazing jewelry for Graduation gift giving. Consider giving something unique and special to mark these special milestones. The winter has been unusually warm and dry so far, but we have been staying very busy here at Karats in Vail Village. We have hosted a few incredible artists in-house including pearl specialist, Koji Kawamoto. Koji joins us a few times a year from Japan and he brings his unmatched expertise of saltwater and freshwater pearls. Koji has knowledge beyond his years and he will delight in matching you with the strand meant just for you. Koji will be back just in time with a new collection for Easter. The Burton US Open just concluded and a lot of our long-time favorite friends have been stopping by for some fresh jewels. Local artist, April Aultman, just recently created a whole new collection focused on vibrant color and you can come and try her designs on first hand. The color combinations are simply stunning in her spring collection and must be seen in person. We hope you are getting out on the mountain to enjoy the sunshine! Please stop in and say ‘Hi’ and check out the latest creations. Don’t forget that we love to do custom orders! If you cannot find what you are looking for; we will create it for you. Fall in Vail has been wonderful. Most days have been mild with cold evenings. We are beginning to see snow on Gold Peak. The World cup athletes will arrive soon. Karat’s is filled with great jewelry distinctly made and uniquely displayed for your delight. We are currently open from 10:00am – 6:00pm Monday thru Friday and 11:00am – 6:00pm Saturday and Sunday. Now that it’s officially off season consider bringing in your jewelry to be cleaned or repaired. Also, start thinking about Christmas! The sooner you place that order for a one of a kind jewelry piece the easier it is for us to have it done by the holidays! The bright golden leaves of October are turning to dusty gold. The sky often feels as though snow is not too far away. Predictions are for a very snowy winter. At Karats we are busily planning for the upcoming holidays. Koji Kawamoto will be at Karats on December 22-24 to show you his vast array of unusual pearls. Carolyn Tyler will arrive on December 26 with her custom goldsmithing designs. These folks are two of our most acclaimed artists and always bring pieces that are both stunningly beautiful, original and unique. Stop by Karats for a personal conversation about your holiday shopping ideas. Let us help you pick a heartfelt selection that reflects your desire to find a truly special gift! As a reminder, we can also help to redesign an existing piece into something new. Please visit us to see Dan Telleen’s newest works, as well as the work of several other artists. To find a work of original artistry and lasting beauty, stop by Karats on your next visit to Vail Village. At the moment our hours are 10 a.m. to 6 p.m. on weekdays and 11 a.m. to 6 p.m. on weekends. On November 17 we will extend our hours to 10 a.m. to 9 p.m. on Friday, Saturday and Sunday. Believe it or not winter is almost here! With a light dusting of snow gracing higher elevations on September 23rd we’re starting to look forward to the best season of the year. Restaurant week kicks off on September 29th and lasts through October 8th. It will bring great specials to town on food and beverage at some of your favorite places. October will bring back the annual ski and snowboard swap at Dobson Ice Arena and before you know it Vail Mountain will be open for the ski season on November 17th! Now that it’s officially offseason consider brining in your jewelry to be cleaned or repaired. Also, start thinking about Christmas! The sooner you place that order for a one of a kind jewelry piece the easier it is for us to have it done by the holidays! Fall is just around the corner but that doesn’t mean that the activities won’t stop! Gourmet on the Gore will be showcasing some of Vail’s best cooks starting September 1st through the 4th and Octoberfest follows right after that on September 8th through the 10th and the 15th through the 17th. We’ll also see Taste of Vail and Restaurant Week all before Vail Mountain closes for the summer season on October 1st. We are open from 10:00AM to 9:00PM until Labor day and then go back to 10:00-6:00 off season hours. As fall rolls in and kids go back to school now is the time to bring in pieces that you need repaired or cleaned. Also, start thinking about Christmas! The sooner you place that order for a one of a kind jewelry piece the easier it is for us to have it done by the holidays! Summer is finally here for the town of Vail and we are kicking it off with the GoPro Games. They are hosting events such as paddle boarding and kayak races, slack lining and sports for dogs. We are open from 10:00AM to 6:00PM but starting June 19th we will be open from 10:00AM to 9:00 PM. Don’t forget your Father on Father’s Day June 18th. Stop by when celebrating his big day at the farmers market, which begins on Father’s Day! We will unfortunately not have the CoMA tent up for this season’s farmers market. Dan will be gone at his Oklahoma City show until Saturday June 24th. Some artists that we will be hosting this summer are Carolyn Tyler, Clare Ullman, and Koji Kawamoto. The Carolyn Tyler’s Collection will be at Karats with her representative Merrien July 1st through July 4th. Koji Kawamoto’s show is July 27th through July 31st. Clare Ullman’s show starts August 10th and ends August 13th. Thanks to everyone for making it a wonderful ski season and a happy end to the year. Don’t forget your mother on Mothers Day, May 14th. Delight her with a thoughtful, special gift from Karats. Many of the Karats crew is gone until June. We will however remain mostly available and open throughout the slow season. For the month of May we will be open Monday – Friday 10-6 except for the week of May 8-14th we will be closed. The rest of the month we will be open 10-6 M-F and 12-6 Sat & Sun. Dan will be available any time for appointments. We will be preparing for a busy summer and look forward to the Farmers Market which begins on June 18th, Fathers day! Some artists that we will be hosting this summer are Carolyn Tyler, Clare Ullman, Koji Kawamoto. We will be posting that schedule soon. 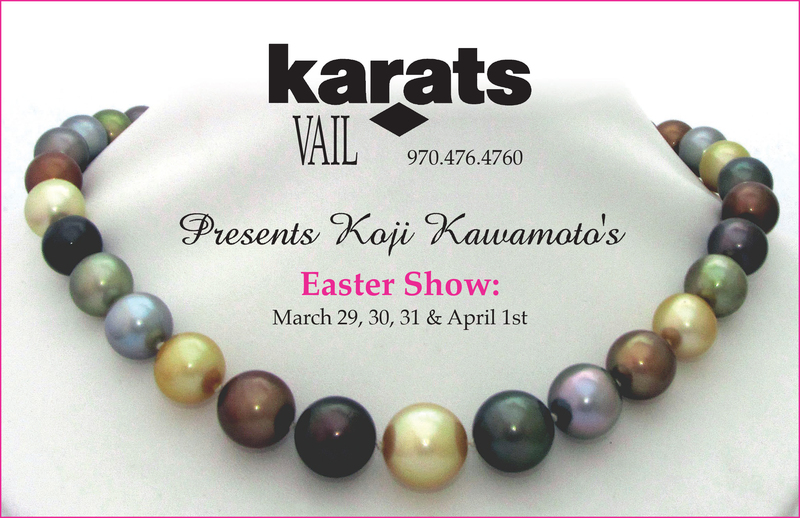 KOJI, our own pearl expert, will be back April 12, for Easter Week! He will have an unusually beautiful selection of precious pearls from around the world reflecting Spring. March and April are well on their way with the longer and warmer days! We all love springtime in the mountains. Karats continues to be such a unique studio in Vail, with its working studio and jewelers on site. Let us help you update this season with a new piece of jewelry that you help design. Or maybe you stop in to treat yourself to a piece by Dan Telleen because you don’t have one yet! We will be open evenings until the mountain opens. March is predictably the snowiest month of winter although it has arrived with Colorado’s famous blue bird days. The skiing has been epic and winter seems to be flying by! Dan and several of Karats jewelers attended the Tucson gem show and found some new and unique materials to work with. If you are thinking of a special project it is a perfect time to stop in and start creating with us. Dan will be back from his surgery in Florida (not a big deal) just in time to host Koji and his pearls during Easter weekend Friday April 14th thru Monday April 17th. Please stop in and see the largest variety of pearls that can be seen any where in the valley. Koji enjoys sharing the history of the pearls, educating the customers about the various types of pearls and matching the pearl to the person. Koji and his pearls are quite amazing so please come in and take a look! Karats still continues to be such a unique store in Vail with its working studio and jewelers on site. Let us help you update your spring wardrobe with a new piece of jewelry that you help design. Or perhaps just stop in to treat yourself to a piece of Dan Telleen jewelry because you don’t have one yet! March and April offer longer and warmer days. We love springtime in the mountains and hope that you will enjoy it as much as we do! January has been incredibly snowy here in Vail-maybe record-breaking? We have some of the highest snow banks we’ve seen in many years. We’ve had several days in a row of snow, and even a snow day for the local schools, which is very unusual! Obviously the mountain is in fantastic shape and snow sports are the order of the day. We will host Elyria Jewels in February and Koji will also return to Karats in February. Dan continues to make some incredible jewelry. Our winter hours are 10:00 a.m. -9:00 p.m. The Tucson gem show is coming up and we are scouting some unique materials to work with. If you’ve been putting off a project think about sending us on a treasure hunt for you. We’d love to make you the piece of jewelry you’ve been waiting for. Come in and take a look. Happy New Year! We wish you the very best of everything (including a treat from Karats), along with health and prosperity for you and yours in 2017! December’s here, bringing tons of snow with it! Vail is happening and last night we had a foot of fresh snow. The first Winter Daze concert will be tonight. There are lots of exuberant skiers here and some super frosty temperatures to go with. Karats will feature a booth at the 1st winter market on Dec. 11th , 2016 Sunday, come out and buy some incredible handmade jewelry for gift giving. Support the local artists you know by browsing and buying. Koji Kawamoto will be our first guest here at Karats. He will begin his show on Dec. 23rd– 27th. Then Carolyn Tyler will arrive on the 28th and get going on the 29th with her trunk show. She will stay until the 1st of Jan. Vail is so beautiful, particularly at the holidays. Karats is the place to do your holiday shopping for the special people in your life (and maybe a little something for yourself)! Stumped for ideas? Let us help and make suggestions. Come in and see all of the dazzling and creative designs we have to offer. Halloween was quite a treat here at Karats. Such incredible costumes and all ages too! As we move into November, we’re getting Dan all ready for his show in Oklahoma City and sending him off on that adventure. So far, we’ve been enjoying a mild and gorgeous fall, but everyone is eager for skiing. Lots of people are getting ready for the holidays. If you’re one of those thoughtful gift givers, please come into Karats so we can make you something amazing for someone you love or for yourself! Ingrid Antoni of Aspen, Colorado and Golden Bough fame. Her jewelry is elegant and goes nicely with Dan’s organic style. Her jewelry is quite functional and goes with everything. We also have Clare Ullman of Berkeley California. Her jewelry is great too and has a fun, colorful style–well priced, really beautiful stones, and a variety of silver and gold items. Come in and take a look. October had a beautiful beginning and now on Oct 6th we see our first snow! So Halloween is next and lets all hope we have lots of early ski season visitors. Before you know it they will be making snow on Gold Peak. We are making lots of beautiful jewelry for upcoming holiday gifts. If you want something truly special, stop in and lets get it going! Happy August! We have been so busy here at Karats. Just finishing up a show with our favorite pearl guy, Koji Kawamoto. The summer market is in full swing and the peaches are delicious. Karat’s is happy to sponsor a tent on the street which is dedicated to artists of all ages who want to come up and sell their jewelry. It has been so exciting to see what people are creating. The crowd has been quite large on Sunday so we have had the pleasure of meeting many new friends. Dan is involved heavily in the Rotary Duck sales and I hope we can encourage everyone to come buy a duck, the Rotary Club is involved in so many good causes. One of which is dear to our hearts the “Zeke Pierce” scholarship at CMC. The scholarship sponsors a dedicated 3rd year student trying to become a EMT. Since we live in a very active location the more EMT’s we have the better. Buying a duck is part of this scholarship and many more. Come support the effort! Lots of beautiful jewelry here at Karats. Please stop in! We have a wide variety of Peace Symbols in Karats right now, in both gold and silver. Please stop by and take a look. They are really lovely and we have a selection of necklaces to complete them. We are experiencing a lovely summer here in Vail. The flowers are incredible and the weather has been truly glorious. Never too hot and never too cold. The town of Vail is bustling with events at the Ford Amphitheatre. We at Karats are preparing for a showing of the Carolyn Tyler Collection which will begin on the 2nd of July and go through the 4th. It awesome to see so much work of this stature/quality in one place. The jewelry is 22k and really outstanding craftsmanship and design work by the glamorous designer Carolyn Tyler. Talking with her and having her show you her work, or working with any of her staff is truly an experience. Toward the end of July we will host our adopted son Koji. He has friends throughout the valley now and people love him. What a treat to have these two here with us in July. Dan is hard at work on many projects and has new jewelry springing out of the oven all the time. Come in and visit if you haven’t in a while. We so enjoy visiting with old friends. Summer has arrived and more beautiful than ever. Nothing beats Vail in the summertime…Wild flowers, talented musicians, orchestras and ballet. Absolute Paradise. After reveling at all of nature’s beauty, stop by Karats and see the beauty in the art of jewelry. What a wonderful time to enjoy the sun and treat yourself to some spectacular artwork for the body to start off a new season. The amazing designer Carolyn Tyler will be spending a week with us displaying her unique jewelry designs, all the way from Bali. If you have not had a chance to experience her designs….now is the time. Her collection arrives July 2 and will be showcased until the 4th. Also, our favorite pearl specialist, Koji, will be here displaying his wide array of pearls and knowledge of pearls July 28-31. Dan is in Oklahoma at a jewelry show at this time and he will be coming back with fresh ideas and new concepts. Our summer hours will be from 10-10 everyday. So depending if you are enjoying your day or evening….there will always be a minute to stop by. Please come say Hi and experience some of Dan’s newest creations and remember he is always happy to make specialty custom pieces. We enjoy visiting with our regular customers and also love seeing new faces. Memorial Day Weekend is coming and we are all looking forward to the start of the summer season. But, with that said, we still enjoy the quieter pace of the off-season after a very busy Winter. It’s a time for us to rest, relax a little, maybe travel and most of all re-energize for the upcoming summer, with all the promise of Vail’s exceptional recreation and cultural activities. At Karats we’re planning our upcoming shows, as well as preparing new pieces to show you when you arrive. We’ll have Carolyn Tyler here Fourth of July Weekend with her amazing gold jewelry. Stop by and meet the artist, ask questions and visit with our staff. We would love the chance to show you what’s new and beautiful here at Karats! Summer is almost here and we will welcome it with open arms, especially after a fabulous winter. Biking, camping, paddle boarding and golf….Why not compliment that with a visit to Karats!? What a wonderful time to enjoy the sun and treat yourself to some spectacular artwork for the body to start off a new season. The amazing designer Carolyn Tyler will be spending a week with us displaying her unique jewelry designs, all the way from Bali. If you have not had a chance to experience her designs….now is the time. Please stop by the first week in July to see mind-blowing creations. Also, our favorite pearl specialist, Koji, will be here displaying his wide array of pearls and knowledge of pearls. Dan has also been busy manifesting his visions into works of art; fans can look forward to some really beautiful new pieces from him this Summer. We are open at Karats from 10-6 during the off season, so come in and visit. We are happy to accommodate special requests as the season nears its end, so please call ahead if you have visions to be fulfilled. And for the busy locals needing any pieces fixed or just a simple treat for all the hard work we put in during the winter, please stop by and see us! Koji will be gracing us with his treasures the last weekend in March into the week of Easter. With the mountain closing early this year, we anticipate the volume of people to be immense, so get in line first if you want your own Koji signature pearls. Dan has been busy manifesting his visions into works of art; fans can look forward to some really beautiful new pieces from him this Spring. We are happy to accommodate special requests as the season nears its end, so please call ahead if you have visions to be fulfilled. February arrived, bringing with it snow, snow and more snow! The skiing here in Vail has been unbelievably great every single day. The days are getting longer and sunnier, and the temps are expected to gradually warm up this week. Most of our customers must be skiing hard, because we never see them until after dinner. We have been open at Karats from 10-10, so come in and visit. We are hosting Koji Kawamoto for Valentines Day. He is expected to begin his pearl show on the 12th– and go through the 14th. Dan is getting his yearly supply of gems in Tucson at the Gem Show; so fans can look forward to some really beautiful new pieces from him in March. Note to Self: Remember your Sweetie on Valentines Day. It will be here before you know it. Please let us help you pick out the perfect gift to express your love. You can always call ahead if you’d like a special gift wrapped up, ready and waiting for you. Come in, say hi, and see what’s new and beautiful here at Karats. We managed to stay jolly throughout the busy holiday season and now everyone is looking forward to a very exciting new year. We began the Christmas season with a bang! On December 19th we hosted Koji for his annual pearl show over the Christmas holiday. His beautiful pearls were such a hit that he returned for an encore show. Karats also had the pleasure of hosting goldsmith, Carolyn Tyler, this December 26th, until the 29th. We now have Carolyn’s latest designs right here in Karats Gallery. Please stop by Karats and see her unique creations for yourself! We’re always happy to answer your questions. The snow is fantastic on Vail Mountain, as Mother Nature gave us a great start, along with all the snowmaking. The sun is shining, and the days are getting longer. It’s a great time to be in Vail. We’re having an exceptional beginning and fabulous start to 2016. Come join us and see what’s new and beautiful here at Karats. We survived Thanksgiving and everyone is feeling stuffed. Karats is beginning the Christmas season with a bang! On December 19th we will be hosting Koji for his annual pearl show. Koji will be in Karats until Christmas Day. Dan will man the store on Christmas Day and then we will host Carolyn Tyler for her show on December 26th, until the 29th. Vail Mountain is open for the season and the snow is fantastic. Along with all the snowmaking, Mother Nature gave us a great early season start. We’re having an exceptional beginning. We are looking forward to an amazing holiday season here in the Colorado High Country. Please come join us and see what’s new and beautiful here at Karats. Happy November! Vail has enjoyed a lovely Indian summer/fall this year. It’s finally turning cold, the days are shorter, and we know that a fantastic winter is just around the corner. It snowed steadily all day today, and we’re sure we will be skiing soon. Dan will head out to one of his all time favorite shows in Oklahoma City in November. Many new items have been made here at Karats. Most of the artists we represent have given us their new designs, and we are stocking up for Thanksgiving and then of course Christmas. As we do feature our favorite designers, we will again have Koji doing a pre Christmas show, and then Carolyn Tyler will start her show the day after Christmas. Both Koji and Carolyn have a fantastic group of clients. As a reminder, the holidays are on the horizon. Make sure you call or email if we can assist you with a custom design for that special someone. So stop in and see what’s new and beautiful here at Karats. Fall has arrived and this October we have had the most lovely, long-lasting show of yellow aspens. Also this month lots of folks visiting in town, along with many visiting by the day from Denver, have taken advantage of restaurant week specials. Locals have had fun eating in all the restaurants too! Here in Karats we are getting ready for Dan to go to his Oklahoma show, as well as for the upcoming ski season. We are showing many new pieces of jewelry in the store. Please stop by and see them and take time to chat with the staff. Next month we will be announcing the dates of upcoming shows here at Karats. September is here. A few yellow aspens are showing up and reminding everyone that summer does end. Summer romance is the subject of many new novels. It is also the subject for many who decide to get married in the fall. Some really wonderful engagement rings have recently found their way out of Karats and into the world. Labor day weekend we will be hosting a show with the work of Elisa Browsh. Her company is called Elyria designs. Her jewelry is a lovely mix of raw stones and various different metals, ranging from rose gold, yellow gold, white gold to sterling silver. The jewelry is really awesome. We are delighted to have Elisa do a show here at Karats. She is a worldwide traveller who brings that kind of enthusiasm to all of us through her work. The duck race also marks the end of summer here in Vail. Look for the Race on Sunday of Labor Day Weekend, (September 6). El Nino may be helping us out this year so lets hope for great early snow. In the end of July and beginning of August we had Koji Kawamoto back. He is embarking on a long road trip and started out his journey by visiting us and showing many more of his beautiful pearls. At the moment we are working with our interns to close out their summer, before they go back to college. So many young people in the Vail Valley are beginning to have an interest in metal-smithing, and of course, we think that’s great! We are hoping to do something in the fall with these kids. Labor Day Weekend we will host a show with the work of Elisa Browsh. Her company is called Elyria designs. Her jewelry is a lovely mix of raw stones and various metals, ranging from rose gold, yellow gold, white gold to sterling silver. We are delighted to have her do a show here at Karats.The jewelry is awesome and we hope that you will make time to stop in at Karats and see for yourself how unique and wonderful her pieces are, up close and personal! We are having some stunning late summer weather and we invite you to come to Vail and enjoy it with us! July in Vail = warm days, cool nights – perfect! The first couple of Vail Farmers Markets have been really busy and going well. The crowd was great last Sunday; they come to see the wide variety of fresh produce, food vendors, artists and all sorts of wonderful offerings! Our show with the Colorado Metalsmith Association was fun. We transformed Karats into a show case for all the artists that are part of the group and some that are represented here. We had an artist reception and then went on to do the Sunday market. During July we will be having a showing of the amazing designs of Carolyn Tyler. She is a Santa Barbara, CA native but spends most of her year in Bali. Her work is mostly 22k/ 18k granulation in the Indonesian tradition. Museum quality work with stones from every corner of the world. Her representative will be here on July 24-26th. After Carolyn we will host Koji Kawamoto on the last weekend of July 31- Aug. 2nd. Let’s not forget we have some great new pieces of Dan’s too! So bring your sun hat, suntan lotion, good walking shoes and come enjoy all that Vail and the Colorado High Country have to offer. We hope to see lots of folks turn up for these amazing artists’ shows. There is always something interesting going on at Karats – please come and be part of it! As the old melody goes, “June is busting out all over” – Finally! The weather has been warm and sunny recently, the flowers are blooming and it really does feel like summer is here, (although there is still plenty of skiing at nearby A-Basin). Vail has had the privilege of being visited by a large moose this past month. As you can see, she showed up in our web designer’s backyard! I’m beginning to think Karats is a good viewing area for wild animals. Dan has been very busy making some great new jewelry. We are so excited for the summer line up of special events and guest artists we’ll be having here at Karats. There are so many things to do in Vail in the summer, including concerts, festivals, outdoor adventures and just plain lazing the days away in the Colorado High Country. One of the first things happening is the COMA show the weekend of June 21, with which Karats is very much involved. We’ll have more info on that in just a little while. That same weekend, the Vail Farmers market begins. It’s the largest Farmer’s Market in Colorado and is full to the brim with food, art, music and all sorts of interesting things. Summer is amazing here–plan a visit to Vail to be a part of all the special things that are happening, both at Karats and in Vail. We’re looking forward to a bright and sunny summer! Stop by and see us! May is here in Vail. One day it snows and the next day the tulips are back. Typical Colorado spring weather. The Covered Bridge is currently being renovated and so we have a bit of foot traffic down here on Meadow Drive. We are open most days Monday through Saturday. Happy Mother’s Day to all the Moms we know! We are preparing for a show with the Colorado Metalsmith Artists. It will be happening on June 21st, which also happens to be our first Farmers Market. We have two young girls coming to learn about the jewelry business this summer. They will be working in the store and along side Dan, doing custom design jobs, etc. They will both be learning in the old style apprenticeship concept. Throughout the springtime Dan will be preparing for a show in Oklahoma City. Lookout for tornadoes! This April at Karats we are preparing for a show with the COMA group. Colorado Organization of Metal Artists. COMA is a state wide organization of metal artists whose group comes up with lots of educational conferences throughout the year. They are focused on education and teaching the various metal arts techniques. The organization was founded by Ira Sherman, one of the artists we represent. He is a master metal artist and works on metal sculpture mostly now that is very message oriented. It’s amazing and will surprise and inspire most who look into it. We begin with a show called, “Spring into Summer”. We hope to have lots of people who make jewelry with moving parts, animated and whatever folks feel inspired by. This show will be happening on the weekend of our first Farmers market here in Vail. Until then we are working on many special orders and will be open throughout the months’ of April and May. Spring has sprung at Karats! This time of year, warmer, sunny days are the norm in Vail. Interesting things are always happening at Karats. Our adopted son, Koji will be presenting an Easter show for all of his faithful pearl fans. Koji will be here from about April 1st to April 5th, so if the Easter Bunny has pearls in mind, now is your chance. Breaking news: Dan has returned from the Tucson Gem Show with some awesome Opals. It’s great to see him with a selection of these wondrously lively stones. If Opal is your thing, come in and take a look. We will be open every day until the mountain closes. It’s beautiful spring skiing here in Vail. Come join the fun! Amidst all the action and activities of the 2015 World Alpine Ski Championships, our longtime friend and Pearl Master, Koji Kawamoto, is joining us for an extra special Valentine’s Day Trunk Show. Koji is offering a solo show for all his faithful Pearl fans. Koji will be here from about the 11th-14th. He may go to Aspen as he has a strong following there too, but he will definitely save his best items for Vail customers before and during Valentine’s Day. Anyone who knows Koji just loves seeing him, so stop in and say hello if you pass by. Dan is at the Tucson Gem show so you know that means lots of new pieces of jewelry for Karats. We have many new items from some of our newest artists as well. Come in and check out the unique collection we have for this 2015 season. January, a new year, a time of excitement for what lies ahead. 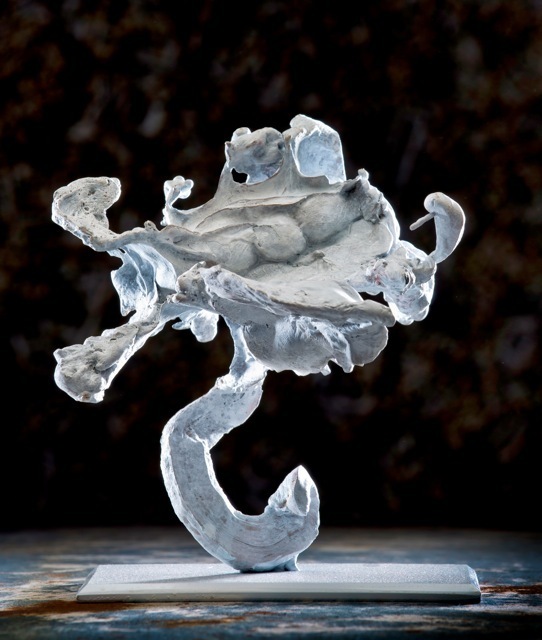 Here at Karats in gorgeous Vail, Colorado, we’re hosting a show featuring sculptor Steve Tobin on January 23 & 24. Dan and Steve are longtime friends and we are so happy to be able to bring this fountain of talent to Karats for you to view his work. Steve’s body of work is quite large. He has worked with metal, ceramics, glass and a vast array of other materials. Steve will take over Karats on Friday January 23rd, and be here to talk with folks about what he is currently creating. His featured items are his “squeezes”. They are small sculptures with wonderful shapes, and colored in a unique patina of many varying colors. He will be installing large “squeezes” on Broadway in 2016 like these small sculptures. Please stop by Karats this weekend to see the work of lifelong artist Steve Tobin. This show is a must see!